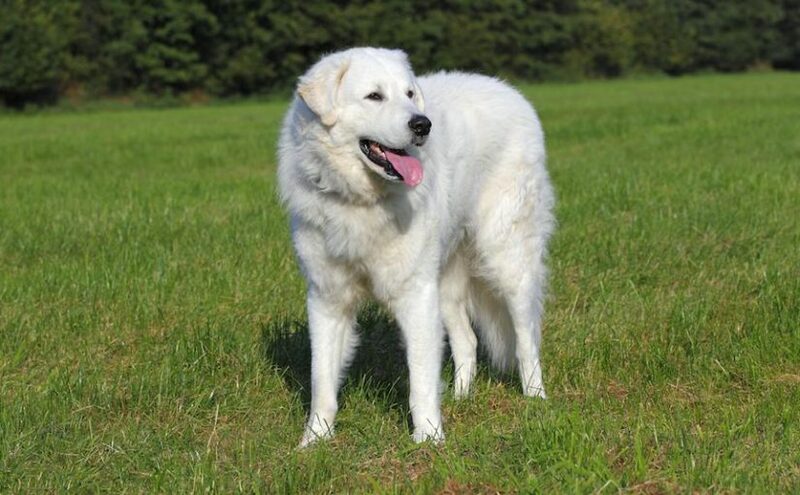 Kuvasz is a Hungarian dog breed whose forbears can almost certainly be traced back to the Tibetan Mastiff, the present-type Kuvasz was first recorded in Hungary in the ninth century. Since that time, they have been widely used in their native land, primarily as guardians but also for tracking, hunting, herding, and as companions. 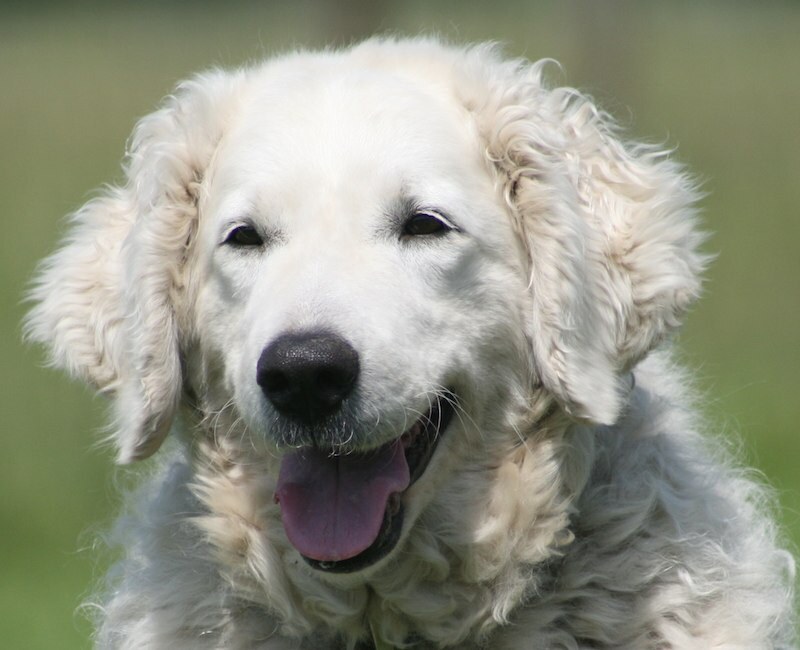 General Appearance: The Kuvasz is a large working dog with a pure white, medium length, wavy coat. Although strongly built, he possesses grace and lightness of foot, with no hint of bulkiness or lethargy, and is exaggerated in no aspect. 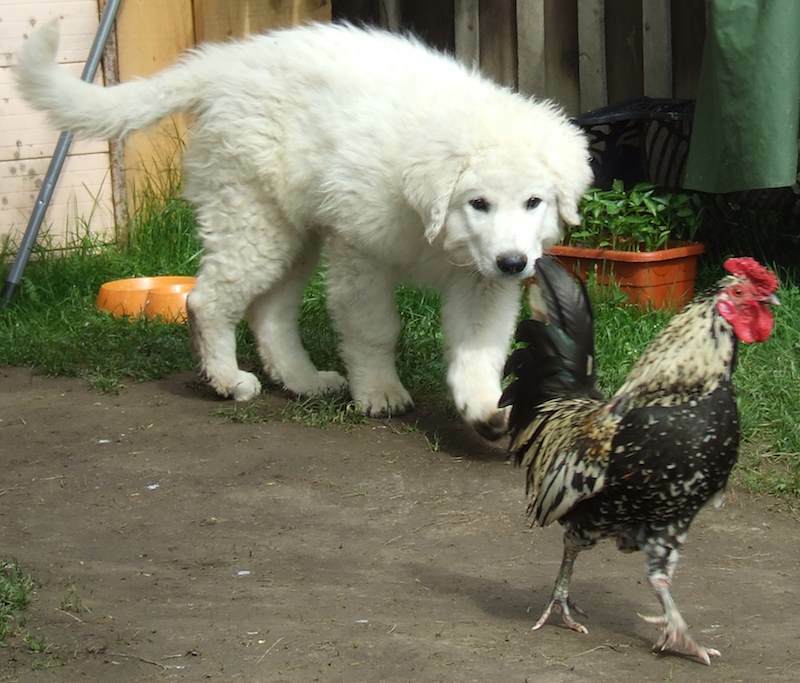 Kuvasz Temperament: Temperamentally, the Kuvasz is an intelligent dog with a great deal of independence of spirit. He has been used for centuries as a guardian and has very strongly developed protective instincts. Kuvasz females: 26 – 27-1/2 inches (66 – 70 cm) high at the withers with a corresponding weight of approximately 66 – 93 lb. (30 – 42 kg). Coat and Colour: The double coat is formed by a coarse outer guard coat and a thick, woolly undercoat. The texture of the guard coat is rough so that the coat readily sheds dirt and shows no tendency to mat. The length of the hair follows a definite pattern: head, ears, front of forelegs, and feet are covered with short, straight, dense hair 3/8 – 3/4 inches (1-2 cm) in length. The guard coat on the body and thighs is medium length 1-1/2 – 4-3/4 inches (4-12 cm). Some coats have long, loose waves, some have smaller, tighter waves. Both are correct, as is anything in between. On the adult dog, the coat must not be tightly curled nor should it lie completely flat, but the degree of waviness will vary considerably from one specimen to another. There is a ruff and mane of longer hair about the neck and chest, more prominent on the males, and feathering of 2-3-1/4 inches (5- 8 cm) on the back of the legs. The tail is thickly covered in long wavy hair 4-6 inches (10-15 cm) in length. 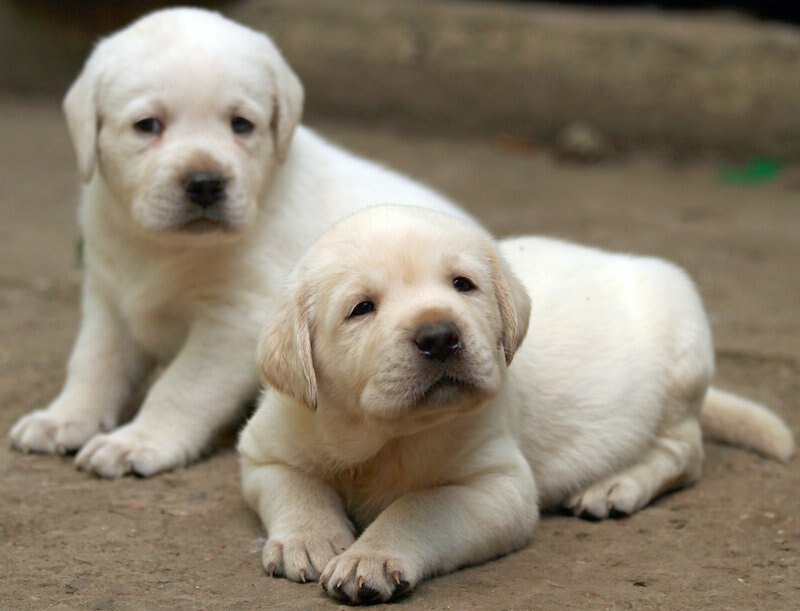 Puppies may have either straight or curly coats but should lose these characteristics with their first adult coat. The coat is a lustrous, pure white, although ivory is permissible, but not preferred. A yellow saddle is to be severely penalized. The skin is well pigmented, preferably grey in colour. The nose, eye rims, lips, and flews are black. The roof of the mouth should be dark. Pads of the feet are black or slate grey and slate-coloured nails are preferred. Head: From the tip of the nose to the top of the occiput should measure slightly less than half the dog’s height at the withers. Viewed from above, the head should narrow, gradually and smoothly, from the ears to the nose. The skull and muzzle are of equal length and the width of the skull should be slightly less than its length. While there is a gentle and graceful arch of the forehead above the eyes, the stop should be only slightly marked. A distinct furrow runs from between the eyes to the top of the occiput. The muzzle, which tapers gently from root to nose, is strongly built with a punishing bite. It is never snipey but neither should it be coarse or clumsy. Skin on the skull and muzzle should be clean, dry and close-fitting. The lips should be tight and show no flews. The eyes should be as dark as possible, ideally a coffee-black. They are almond shaped with close-fitting rims, set well apart and a trifle obliquely. The nose is of good size with well-developed nostrils. The teeth are large and very strong. Dentition should be complete, and the teeth meet in a scissors bite. 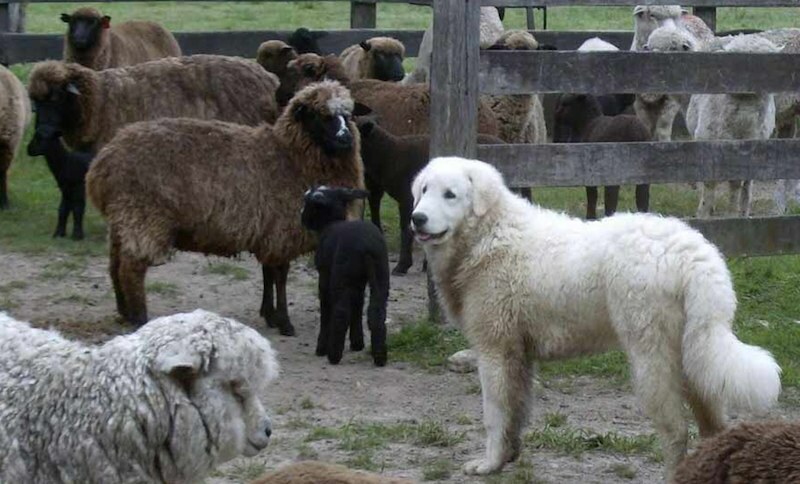 The Kuvasz has drop-ears of triangular shape with a gently rounded tip. Set well to the side and nearly at a level with the top of the head, the upper portion stands slightly away from the head while the lower third falls close to the cheek. When the dog is alert he brings the whole ear slightly toward the front giving him a keen and alert appearance. The ear should be small and neat and when pulled over the face should just cover the eye. Neck: The neck should be powerful, slightly arched, and of medium length. There should be no dewlap. Forequarters: The shoulders are well covered with good, hard muscle. The shoulder blade and upper arm should be at right angles to each other and of good length, allowing the dog ample reach and follow-through of stride. Elbows are close without being constricted and the whole foreleg should describe a straight line from shoulder to forepaw when viewed from the front. The leg should be of good, strong bone, without being coarse or clumsy. The pasterns should have ample spring and the feet should be of the type known as “cat feet,” tight and well arched with deep, resilient pads. There should not be much hair between the toes. Body: The withers are prominent and slope gently into a strong, level back of medium length. The chest reaches to the elbow, with a well-developed forechest and medium spring of rib. The ribs behind the forelegs must taper inward to allow complete freedom for long, easy stride. The loin is strong and gently arched. There is a distinct but moderate tuck-up. There should be a well-formed, slightly sloping croup which is broad and well muscled. Hindquarters: The hindquarters are well angulated. The angle between pelvis and upper thigh should be 90 degrees to correspond with the proper angle in the forequarters. The upper thigh itself should be of good length, creating the correct bend of stifle (110-120 degrees). The bend of the hock joint should be about 130-140 degrees with the metatarsus being short, strong, and perpendicular to the ground. Rear paws are somewhat longer than forepaws but should nevertheless be tight and well arched with deep, resilient pads. Dewclaws are undesirable and should be removed. Tail: The tail is set on low, a smooth continuation of the slope of croup. The tip, when straightened, should reach the hock. The tail hangs straight down and may be slightly turned up at the tip but should not curl when the dog is relaxed. When the dog is excited, the tail will curl up to the level of the loin, but should not be carried over the back. Gait: The trot is smooth, elastic and far-reaching, often showing a tendency for the hind foot to overreach the front. As the dog’s speed increases, he will tend to single-track. When he is moving fast, he will carry his head low, at a level with his shoulders. 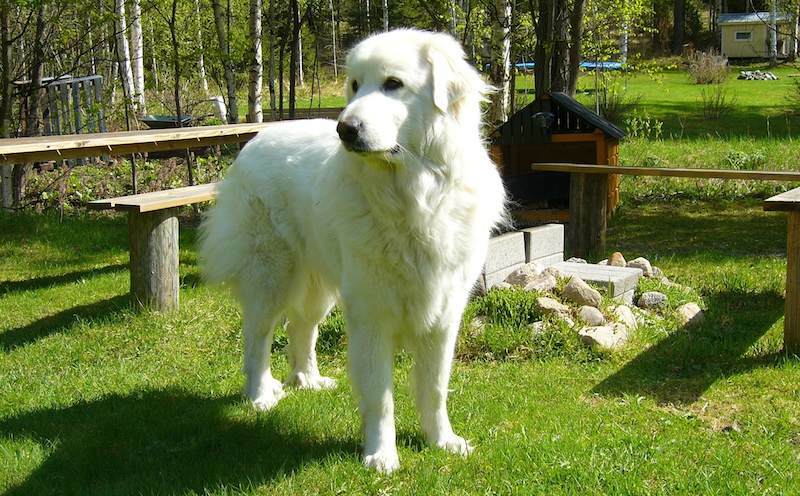 The Kuvasz should move effortlessly, enabling him to travel great distances without fatigue. Faults: Since the Kuvasz is a working breed, any faults of soundness should be considered serious. Faults in type which should be guarded against are: too short a muzzle, apple head or bulging skull, no visible supraorbital ridge, too much stop; giving an uncharacteristic setter-like appearance, drooping haws or pendulous flews, hound ears, lying back in the ruff. Too long a neck, barrel chest, loose or sloppy shoulder assembly, yellow eyes or yellow markings, sullen appearance or distrustful expression (not to be confused with reserve), extreme nervousness, overshot or undershot mouth, gay tail. Disqualifications: Over or undersize as follows ; Males, over 32 inches (81 cm) or under 25-1/2 inches (65 cm) ; Females, over 30 inches (76 cm) or under 23-1/2 inches (60 cm). ; So pronounced a lack of pigmentation as to have flesh-coloured eye rims. ; Colour other than white.